Abu Dhabi-based Calidus LLC is showcasing its B-250 counterinsurgency (COIN) attack aircraft at the 2017 Dubai Air Show. The B-250 is a turboprop-powered light combat aircraft analogous to the Embraer/Sierra Nevada A-29/EMB-314 Super Tucano, IOMAX Archangel and Turkish Aerospace Industries (TAI) Hürkuş-C. The B-250 – previously designated the Bader – was designed in collaboration with the Brazilian vendor Novaer and Rockwell Collins in the U.S. Novaer was responsible for the B-250’s airframe. In fact, the lead designer of the B-250 was Joseph Kovács, who also designed the Embraer Tucano (Aviation Week). However, Calidus claims that a major differentiating benefit of the B-250 will be its lower acquisition and operating costs. The B-250’s airframe was built using carbon fibre composite materials. In terms of avionics, the B-250 uses Rockwell Collins’ Pro Line Fusion onboard electronics suite, which provides a digital head-up display (HUD) and multi-function displays (MFD). Aircrew can view the feed of their equipped electro-optical and infrared (EO/IR) turret in real-time. Calidus will market the B-250 for close air support (CAS) for COIN, training and intelligence, surveillance and reconnaissance (ISR) operations. However, seeing that the United Arab Emirates (UAE) already uses IOMAX Archangel aircraft in the COIN CAS role, it is unclear if the B-250 will see domestic adoption. According to Shephard Media, the B-250 is powered by a single 1,600 shp Pratt & Whitney Canada PT6A-68 turboprop engine, providing a ferry range of 2,400 nm at 557 km/h, payload of 1,796 kg across seven external hardpoints and flight ceiling of 30,000 ft. The turboprop-based CAS market is becoming increasingly saturated, with the Middle East region alone now boasting two distinct platforms – i.e. Calidus B-250 and the TAI Hürkuş-C. 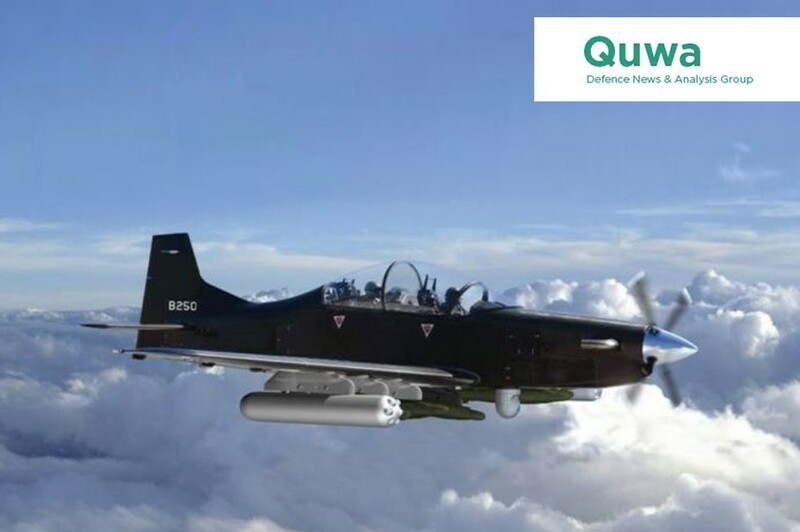 However, these lightweight CAS platforms are also seeing growing adoption in the Middle East as well as Sub-Sahara Africa, albeit the latter has largely settled on the Super Tucano. Manufacturers of these aircraft claim that by virtue of using turboprop engines (particularly the ubiquitous PT6A-series), these aircraft have lower operating costs, yet they – like costlier fast jets such as the F-16 – can deploy precision-guided munitions for CAS and targeted strike engagements in asymmetrical and low-intensity threat environments, such as COIN. These specific environments are typically void of pervasive anti-air warfare (AAW) threats, such as guided short-range air defence (SHORAD) missiles. Regarding the B-250, it is unclear if Calidus will benefit from a domestic market to sustain launch orders (the UAE already operates the IOMAX Archangel). It appears that Calidus will need to focus on overseas sales, but success will be contingent on several factors. First, the size of the addressable market. The Super Tucano alone already has Afghanistan, Angola, Senegal, Mali, Burkina Faso, Ghana, Lebanon, Mauritania and Mozambique as its users, with Nigeria expected to join in the near-term. The TAI Hürkuş-C can rely upon the Turkish market, while Jordan operates AT-802s. This basically leaves Saudi Arabia and Egypt as prospective Middle Eastern buyers of the B-250, and even there will be competition from larger entrants such as Textron, IOMAX and others. Second, securing guided air-to-surface munitions. Although the Turkish industry, specifically Aselsan and Roketsan, have been willing to arm certain non-Turkish platforms, such as the Leonardo AW149 and the Airbus Defence & Space C295, it is unclear if those weapons will make their way to platforms that directly compete with TAI’s solutions, i.e. the Hürkuş-C. Sourcing U.S. weaponry, such as the Hellfire-II, could be an inhibitor due to ITAR (International Traffic in Arms Regulations). However, Calidus may have the option of collaborating with Emirates Defence Industries Company (EDIC), specifically EDIC’s Tawazun Dynamics, to integrate South African origin munitions to the B-250. These can include al-Tariq-S precision-guided bomb (PGB) kit and/or Mokopa anti-tank guided missile (ATGM). This would allow for internal collaboration within the UAE while also imbuing the B-250 with a distinct set of munitions options that are not necessarily bound to U.S. or Western European trade restrictions. This – as well as competitive cost and potentially even financing/credit options – could provide the B-250 the footing to effectively compete with its contemporaries.